Halloween is right around the corner, and with all the costumes, decorations and sweet treats, it’s the perfect season for DIY projects. Instead of your usual store-bought candy, why not try making tasty Halloween treats right in your own home? This easy recipe for DIY salt water taffy is a great example of one of the many ways in which water can be utilized for fun, and it’s the perfect way to kick off fall festivities. Butter your small baking dish and set it aside for later. Then stir together sugar and cornstarch in the medium sauce pan. As you're stirring, slowly add in the corn syrup, butter, water, salt and glycerin. Place the mixture over medium-high heat and stir continuously until the mixture comes to a boil. Once the mixture boils, stop stirring, insert the candy thermometer and wait until the mixture reaches 254 degrees F.
Once the temperature is 254 degrees F, you may remove the mixture from heat and stir in your food coloring and flavoring. The color you use will not alter the flavor or texture of your taffy. Note: Color will fade when the pulling process begins. Allow the taffy to cool. Once the taffy is sufficiently cooled, generously apply butter to your hands and begin to pull the taffy. Do this by pulling up the taffy into both hands, then pulling it apart and back together until the taffy is firm enough to sustain its shape. For a visual demonstration of this process, head here. Now butter your scissors thoroughly (be careful not to cut your hands). Stretch the taffy into a long rope-like shape and use your buttered scissors to cut the taffy at 1 inch intervals. 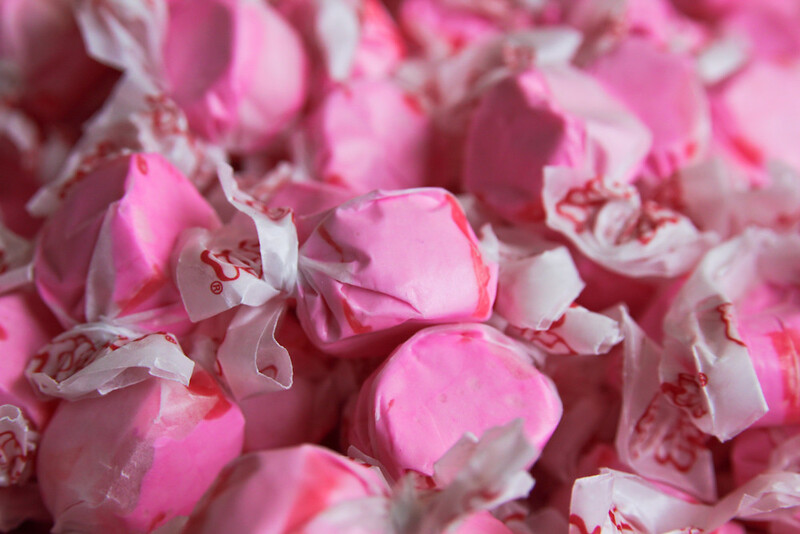 Wrap your taffy in small wax paper squares and store in an airtight container. Now that you’ve made your taffy, it will last you approximately two months. You can keep it around the house as a tasty treat or share with family, friends or even coworkers. Whether you’re indoors handing out candy or going door-to-door trick-or-treating, it’s important to stay safe on Halloween. Don’t forget to check back here to see what other fun and inventive activities you and your family can enjoy this season. Snow Storms, Road Salt and Drinking Water Quality – What’s the Connection?Most people don’t make a connection between salting their sidewalks, driveways and roads, and ...From Lake to Tap: Become a Surface Water Pro in a SnapWe’re used to water being available on demand, but rarely do we stop to ask a crucial question: Wher...U.S. Water Week Highlights Technology and Water ProtectionImproving water and water infrastructure funding in the United States is crucial.